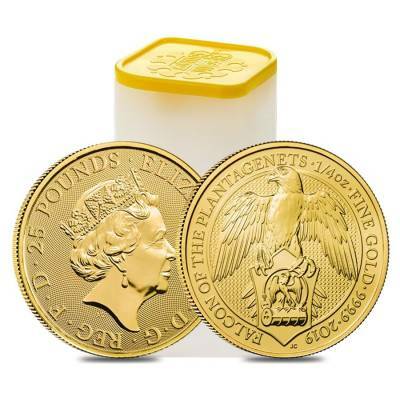 This impressive 2019 Great Britain 1/4 oz Gold Queen’s Beasts (Falcon) Coin is the sixth release in the well-known Queen’s Beasts series from the prestigious British Royal Mint. 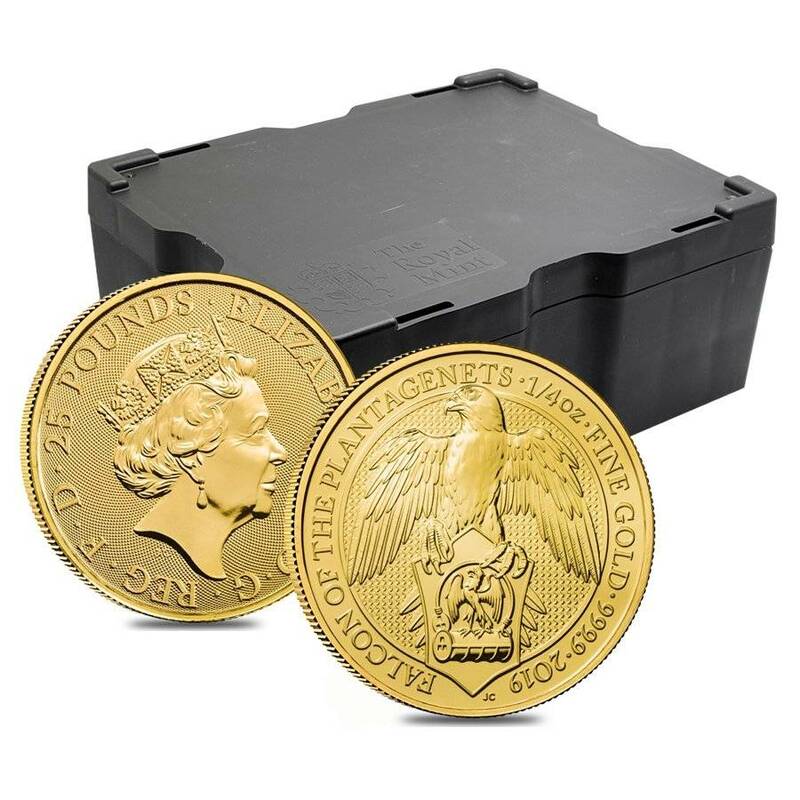 The British Royal Mint introduced the incredibly famous Queen’s Beasts series in 2016 by issuing the “Lion of England” coin. This fantastic program showcases each of the ten heraldic beasts that stood at the coronation of Queen Elizabeth II in 1953. Each beast also supports a badge of arms of the family associated with the Queen’s ancestry. The 1st issue was followed then by the “Griffin of Edward III”, “Red Dragon of Wales”, “White Greyhound of Richmond”, “Black Bull of Clarence“ and shall continue with the releases of the Yale of Beaufort, the White Lion Mortimer, the White Horse of Hanover, and the Unicorn of Scotland coins. 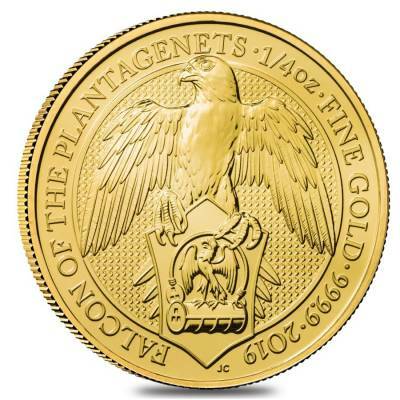 This outstanding edition features a stylized design of the Falcon of the Plantagenets - first used by Edward III of the House of Plantagenet as his badge. 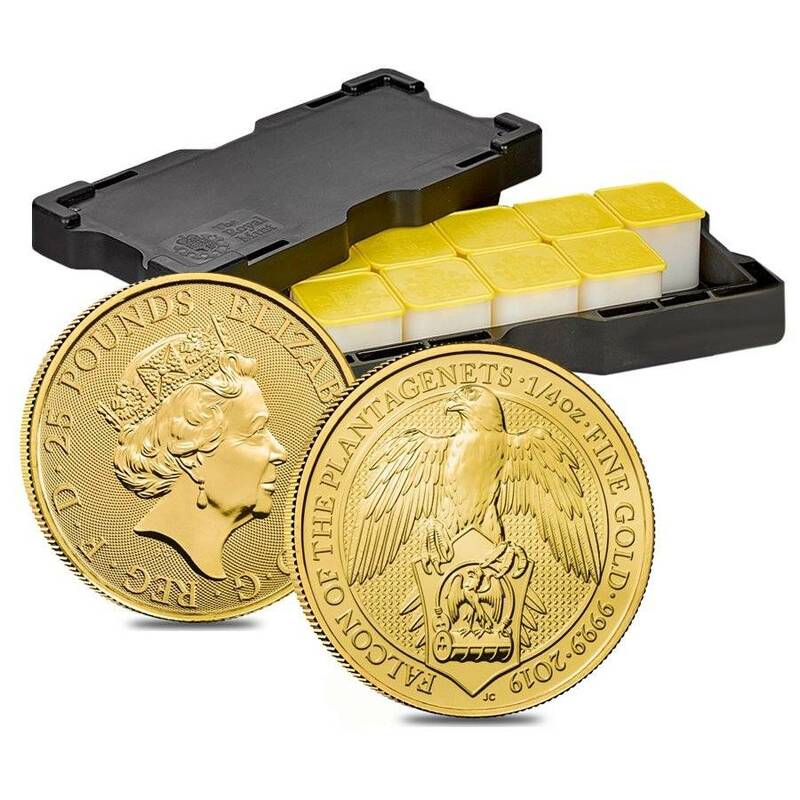 The coin’s huge popularity and incredible design make it a sought-after gift and a treasured addition to any coin collection or portfolio. Made from 99.99% pure gold with a weight of 1/4 oz. 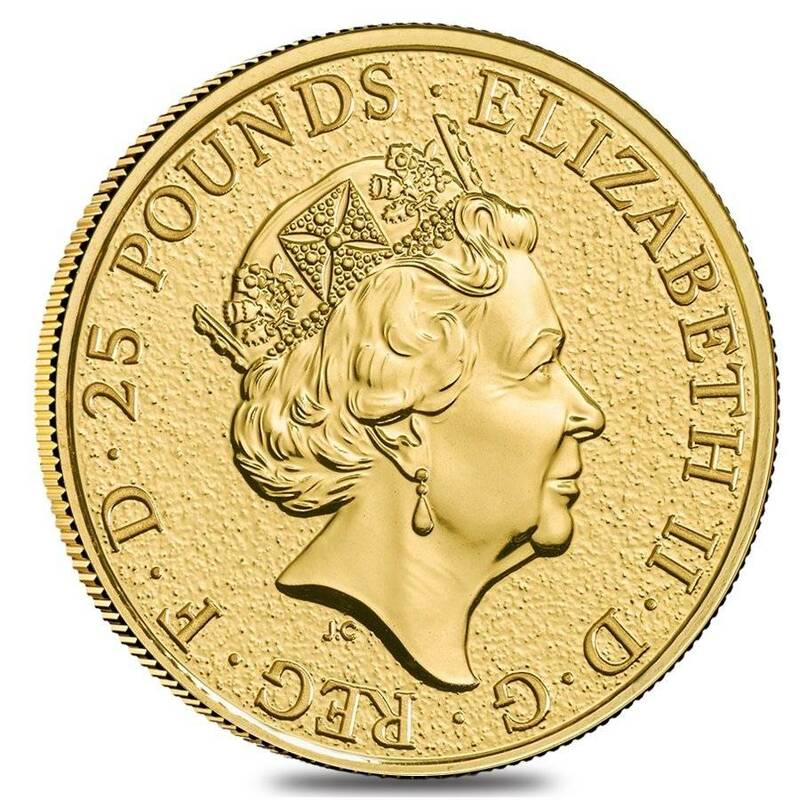 Obverse: Displays the effigy of Queen Elizabeth II, surrounded by the words “Elizabeth II”, the coin’s denomination, and “D.G. REG F.D” (Queen by the Grace of God). 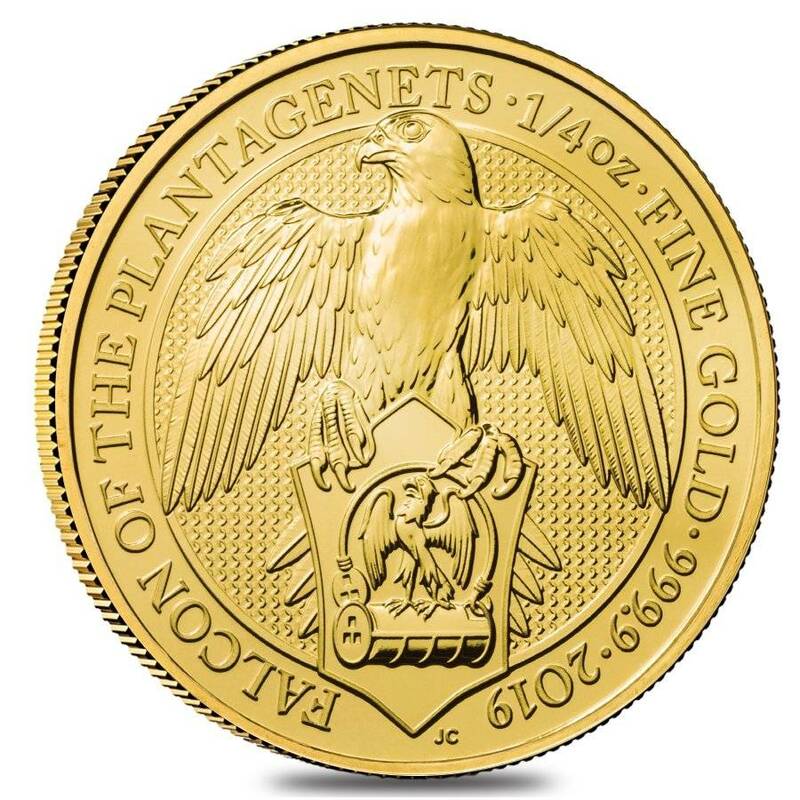 Reverse: Showcases a stylized design of the Falcon of the Plantagenets, framed by the engravings “2019”, along with the weight and purity. At Bullion Exchanges, you will find an exceptional collection of splendid bullion coins produced by top mints. 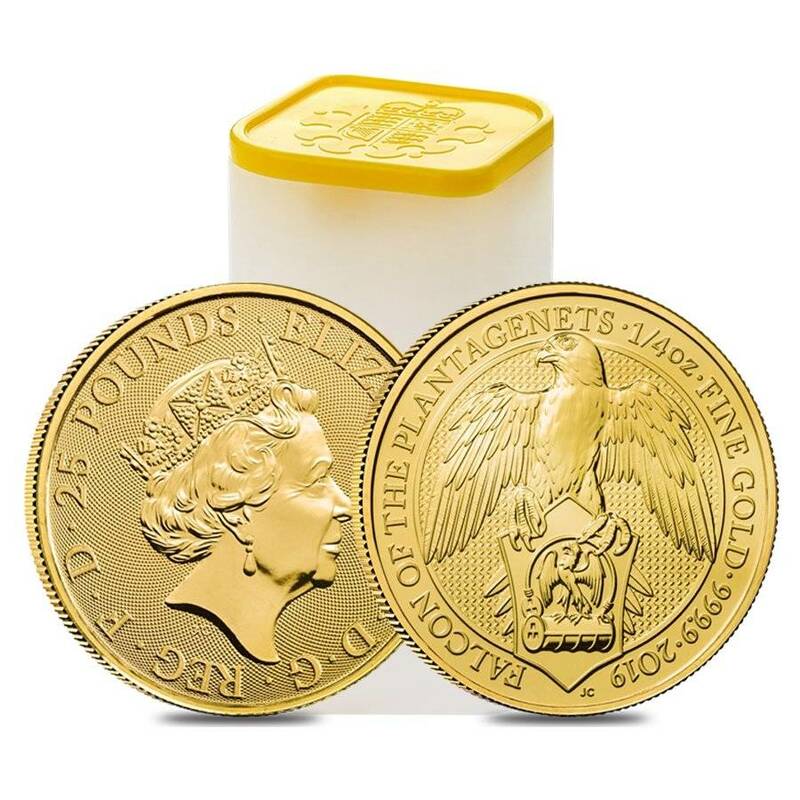 Add this fantastic 2019 Great Britain 1/4 oz Gold Queen’s Beasts (Falcon) Coin to your portfolio today, and it will be carefully packaged and delivered to your address in no time. For any questions, just give us a call at 800.852.6884, or email us, and we will be happy to assist you. 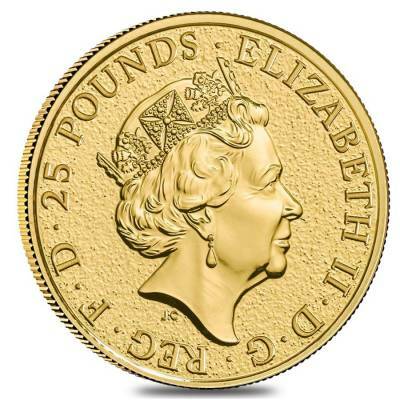 With this purchase, you earn 350 Bullionaire Bucks 350 BB = $0.35. We currently have 844 of this item in stock. For every $1 spend, you will earn 1 Bullionaire Buck which is equivalent to $0.001 off a future purchase. 350 BB = $0.35.